About: San Marco Ristorante & Pizzeria serve a variety of Italian dishes and pizzas with an extensive range of toppings at their restaurant. I and my family have visited San Marco many times and we have NEVER ever been disappointed. The food is always good, plentiful and well cooked / presented, the atmosphere excellent and the service from all the staff also very good. We can only assume that someone was having a bad day on the days of the two poor reviews. Like all things in life it is a matter of personal opinion and we can all personally say that we will always go to San Marco when in London. We think that a good restaurant should be judged on the food, atmosphere, cleanliness and staff.Keep up the good work everybody!!. We visited for the first time last year. The place was empty but for us but we had a very enjoyable meal. We had mushroom tagliatelle, salmon and pizza. All were cooked beautifully, the staff were friendly and attentive but not overly so. Prices were very reasonable. The restaurant and toilets were clean (something I always go by) and the Italian chocolate ice cream was the best I've tasted. 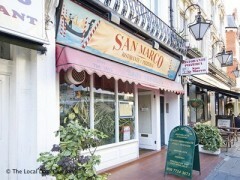 My family are visiting again London next week and are looking forward to a meal at San Marco's. It's also very handy for Paddington. I don't understand the reviewer who said they left after 5 minutes as no one served them. It takes you five minutes to settle in, take your coats off, decide where to sit and absorb the ambience! I love it here, a proper italian restaurant. The waiters are lovely, prompt but not overly attentive. The food is fantastic, again proper Italian fare exactly what you would get in Italy. NOT full of tourists, a mix of people and lots of italian families. Although ALL the food tried to date has been lovely, would highly recommend the Gnocchi with four cheese sauce with lots of freshly ground black pepper - divine. Beware you might have to queue at peak times. I recently visited the San Marco on recommendation and was not disappointed. This is the kind of family run Italian restaurant you dream of finding. Grandmas, kids, mums, dads, friends, all enjoying great food in wonderfully convivial surroundings. Plastic production-line pizzeria this place definitely ain't. The food was plentiful and excellent and the service truly could not be faulted. I loved it. What are you waiting for? Get yourself down to the San Marco now! By far the worst place I've been. While the prices are cheap, the services are even cheaper - luke warm champagne, and a grouchy owner/manager who was more interested in chatting up the bar woman than serving customers! Never again..my advice- stay clear of this joint if your looking for a good meal!